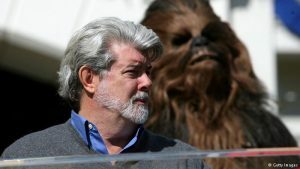 There are many reasons why OUBEY loved George Lucas’s six-chapter film epic Star Wars so much and why it is one of the most fantastic and amazing works in the history of movie-making. One of the main ones is certainly that particular mixture of astuteness and audacity that can be found in the person of George Lucas himself. In the mid 1970s – a dogs-day period for the cinema in general – he recognized that the time wasn’t ripe for the actual Part 1 and that its chances of success were minimal. But he didn’t shelve the project but rather decided to bring Part Four of the saga to the cinema screen instead of Part One – under the official name of Star Wars 1. This decision is probably one of the key reasons for the tearaway success of the whole series. After all, who has ever heard of parts one to three of a saga being published after parts four to six? That’s something really exceptional and probably unique – a really clever, canny move. Nowadays of course it’s become standard practice. After series like Batman and X-Men proved smash hits at the box office, their prequels began to appear with titles like Batman Begins and X-Men – The Origins. 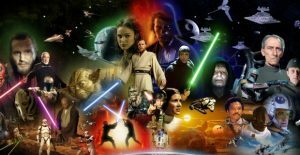 Just what makes Star Wars such an evergreen all time classic was shown in the full-length documentary movie “StarWars – The Legacy Revealed” by Kevin Burns recently screened on the German French TV channel ARTE. This film brings to light and illustrates the particular quality of this movie saga that doesn’t just harken back to and incorporate countless references to myths and sagas from Ancient Greece to the Middle Ages, from religion and psychology but also resonates with the great transformations in history and society like the demise of Samurai culture or the existential clash between democracy and totalitarianism, between republican love of liberty and fascist systems obsessed by power and war. Star Wars is revealed in its true quality as a phenomenal object lesson incorporating the quintessence of over two and a half thousand years of human experience transformed into a world that is neither past nor future because it is beyond time. Wonderfully and lovingly embedded in the heroic journey of Luke Skywalker through a world so fantastic that anything can happen – including the final hard-won victory of good over evil. The victory of good over evil has its essential root in the extraordinary teachings of a green midget with long sideways protruding pointed ears and his own speech syntax which is now understood across the whole world and sometimes even used when something particularly clever needs to be said. Grand Jedi Master Yoda takes the young Luke Skywalker back to the sources of his Force, and teaches him to recognize, steer and control his extraordinary abilities. So many of the characters in the Star Wars saga are glamorous, fascinating and unforgettable figures. The character of Master Yoda reconciles a huge range of contradictions: strength and softness, perseverance and patience, humor and strictness, crowned with an unerringly clear sighted view of things coupled with profound wisdom. Visually cast in the mold of an anti-hero, he is the true Master behind all. 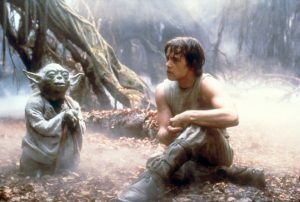 The deeply perceptive understanding way in which he instructs the young Skywalker in the swamps of Dagobah is an example of an ideal pedagogy in the sense Plato intended. He recognizes the strengths and weaknesses of his young Jedi pupil, encourages him to make his own experiences and learn from his own mistakes whilst never ceasing to believe in himself and trust in the Force with which he is endowed. Unfortunately the ways our own kids receive their education are light years removed from such ideals. But should they be? The award-winning magazine WIRED has recently featured an article on this very topic in answer to this question. To open it up to our readership, we’re pleased to pass on the link here. Incidentally, this question was and still is one of the very many areas of agreement in thinking and feeling between OUBEY and myself. They were already there in the time before we first met and in the time afterwards they came together and evolved still further – also thanks to inspiration from the work of people like George Lucas.